1. Trim fat from meat. Brush steaks with oil. In a small bowl, combine paprika, garlic powder, thyme, oregano, lemon-pepper seasoning, salt, black pepper, and cayenne pepper. sprinkle paprika mixture evenly over meat; rub in with your fingers. Cover steaks and chill for 1 hour. 2. Place steaks on the rack of an uncovered grill directly over medium coals. Grill until desired doneness, turning once. (Allow 11 to 15 minutes for medium-rare doneness [145°F] or 14 to 18 minutes for medium doneness [160°F].) Cut steaks into serving-size pieces. Serve with Grilled Peppers. Seed and quarter 4 yellow, red, and/or orange sweet peppers. Brush peppers with 4 teaspoons olive oil. Place pepper quarters on grill rack directly over medium coals. 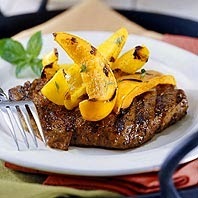 Grill for 12 to 15 minutes or until peppers are crisp-tender and lightly browned, turning once. Remove peppers from grill; cool slightly. Cut peppers into wide strips. Place peppers in bowl. Add 2 tablespoons snipped fresh basil and 2 tablespoons balsamic vinegar; toss well. Serve immediately or cool to room temperature.